It’s almost here: Daylight Savings Time has given us more light-filled hours and the calendar says that soon it will be Spring. While it might not be quite time to toss your scarves and gloves for flip-flops and bathing suits, it is the perfect time to get your outdoor kitchen ready for Spring fun. If you took the time to prepare your Olathe outdoor kitchen space for winter weather, you likely covered most surfaces to insulate and to keep snow and debris from accumulating on surfaces, clogging drains, and staining finishes. So when the weather starts to warm up, it’s time to strip the heavy winter coverings from your space and start from a clean slate. Just like Spring cleaning, getting your outdoor kitchen ready for warm-weather parties, BBQs, and quiet family nights takes a little elbow grease. You’ll need to scrub away any debris, clean surfaces, and freshen the space so it’s ready to use. Before you do—or while you’re cleaning, if you like to multi-task—take some time to think about how you want to use the space. If you’re planning many parties with neighbors, family, and friends, you might want to consider additional seating or storage. Or you might upgrade your grill, add another cooking surface, or shop for new cookware. Sadly, It’s true: it’s still cold enough outside that temperatures will dip below freezing. So you might not be hooking up your water source again, but you could be thinking ahead and breaking your summer-kitchen plan into easy steps. This is the perfect time to decide how you want to refresh or upgrade your space. Have you dreamed of a stone fire pit? How about a pergola? The best part of planning is the ability to make the space truly your own—and that’s what we love to do. Do you have questions about how to transform your outdoor space from ho-hum to WOW? We’d love to help you, so reach out to start the conversation. While wintertime may not be the ideal time to build an outdoor kitchen, there’s no reason you can’t improve the one you’ve got. With that in mind, we wanted to detail a few ways our clients have been adding, improving, and updating. At Huston Contracting, we specialize in Olathe outdoor kitchens. 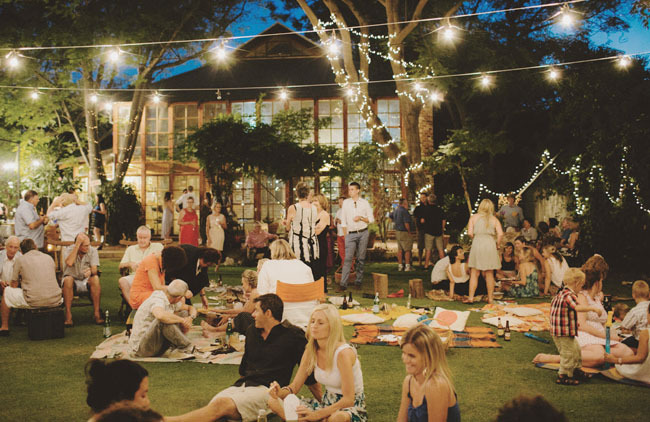 We know how important an outdoor gathering space can be for families and friends. We also know a few minor tweaks can take your space from a place to cook to the premier gathering spot in the neighborhood. One quick and simple way to add a ton of value to your outdoor kitchen? Strip lighting. Use strip lighting to highlight stairs, walkways, and so much more. You can even put lighting under fixed seating areas and storage units. Strip lighting partially makes a space look great, but there’s another aspect to it. Strip lighting is a safety feature when it’s dark out. One way to add huge entertainment value to your outdoor kitchen area? Add a stunning fire pit that the whole family can sit around. These days there’s a fire pit for every size and situation. They have some that can be moved around to different areas, while others are designed to stay in one place. They even have fire pits that can double as coffee tables. Often, a family builds an outdoor kitchen with cooking and socializing in mind. Building an outdoor bar is often an afterthought. But maybe it shouldn’t be. 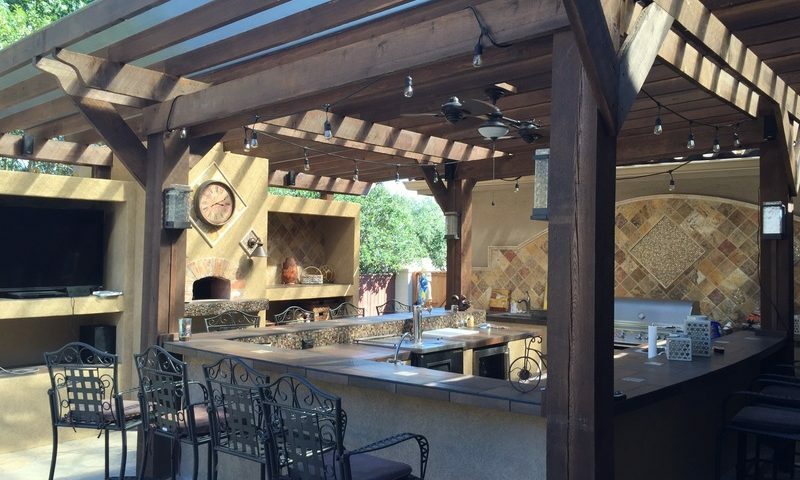 Most Olathe outdoor kitchens would only need a few minor updates and additions from a professional, like our staff here at Huston Contracting, to turn your outdoor kitchen into a bar/kitchen combo space. At Huston Contracting, we’re a little partial to outdoor kitchens with natural stone. While you can build with any style you please, we’ve found natural stone truly compliments the outdoors better than almost any other material. If you’re looking for a quick improvement, add a little stone around the area. Ok, this is a little bit more than a quick and simple improvement. In fact, most will want to work with professionals to add a covered porch to their outdoor kitchen. But, there’s no denying the benefits of adding covered space. Many families start to use their outdoor kitchen more and more each passing year. Instead of taking the food inside, they want to eat it in the great outdoors – where it was cooked. That’s where a covered porch comes in. Instead of baking in the sun or worrying about the rain, you simply cook the meal outdoors and then eat it under the comforts of your covered porch. A true win-win! Fall is right around the corner and there has never been a better time for an Olathe outdoor kitchen installation. With all the exciting events coming up, you’ll have ample opportunity to gather friends and family for some good food and great company. If you’re hosting a birthday party, then an outdoor kitchen offers the ideal place for you to host family and friends. You can cook, socialize, and host in the outdoors. No need for anyone to enter the house and make a huge mess. Since birthdays can happen all year around, your outdoor kitchen may get a lot of action in the spring, summer, and fall. Hosting outdoors in the winter is never a great idea in Olathe, but you can use the grill to cook up some fresh meat. Nothing says America like a backyard BBQ on the Fourth of July. Talk about a great time! With your new Olathe outdoor kitchen, you’ll be able to invite over the whole neighborhood for a day of fun in the sun and delicious food. In Olathe, we really love our summertime holidays. Labor Day is another great time to put your outdoor kitchen to use. Kick off fall by having a smorgasbord in your stunning outdoor abode. That is the perfect time to catch up with friends and show them your new home. Who doesn’t like some grilled steak fajitas on Cinco de Mayo? Cinco de Mayo is the official start of summer when Olathe outdoor kitchens are of concern. This holiday offers the perfect time to begin the grilling season for good. Summer is truly here when Memorial Day rolls into Olathe. 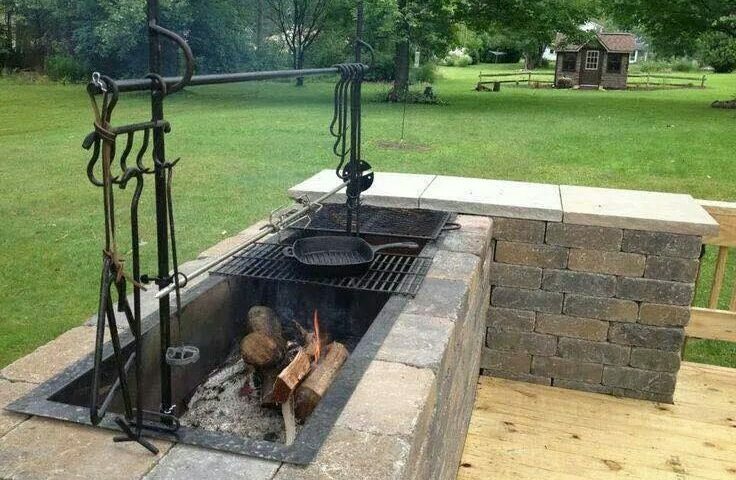 Invite all your pals over for an old fashioned BBQ at your outdoor kitchen. The sun will be shining and you can whip up a delicious meal while being outside. You can use your outdoor kitchen to cook a great meal, enjoy the company of loved ones, or just relax whenever you want. You don’t need a special event or date to grill out or have friends over to your impressive area of landscape design. If you’re ready to install an Olathe outdoor kitchen before winter rolls in, get in touch. Here at Huston Contracting, we can help you build the ideal landscape design throughout your property – including a unique outdoor grilling and seating area. It’s that time of the year, again. It’s cold, but in less than two months the weather is going to take an expected turn for the better. Instead of below-freezing temperatures, we’ll be greeted with warm weather and the sunshine. If you’re anything like me, you can’t wait. And what does warm weather bring? Cooking outdoors! There’s never a better time to get out in your Olathe outdoor kitchen and whip up some delicious eats. Gone are the days of prepping the food inside and then bringing it outside to grill. These days you can set up your Olathe outdoor kitchen so you can get all of your cooking done with nature. And how can you do it? By adding functional zones to your outdoor kitchen. Add more counter space. When designing or adding on to your outdoor grilling mecca, make sure you add more counter space than you think you need. Think of a plan that seamlessly flows from the refrigerator to the counters to the grill. If socializing is on the docket, don’t forget to include a bar area around the grill, too. Traditionally, the grill has been the focal point of the outdoor kitchen. Pretty much everyone knows this. However, things are changing in 2017. Outdoor cooking options are becoming more robust, and people want variety. Hot dogs and hamburgers are only tasty so many times in a row. Enter open-flame barbecues and pizza ovens. Many people who love cooking outdoors have added one of these two options to their outdoor cooking areas. If you’re feeling really crazy, you could even add a wood-fired pizza oven to your outdoor kitchen to up the ante in the neighborhood. Olathe outdoor kitchens have been steadily evolving. At first, you probably had a grill, a few chairs, and an umbrella. Then people started adding counter space and stainless steel appliances. Now, it’s time to take things up a notch. Some of the best outdoor kitchen designs we’ve seen have been incorporating open-air patio structures to protect their outdoor cooking haven. These covered kitchens feel outside, but still protect the space from rain, sleet, and snow! If you’re going to invest into your outdoor haven, then don’t forget about the entertainment options. Beer taps, flat-screen TVs, plush lounge chairs, and wine refrigerators have all been incorporated into modern outdoor kitchen designs.